22 February 2017 New Delhi- After nasty winter finally summer is about to come and most of us are worried about Tanning , dust and pollution which causes damage and form layers of dead skin cells on your skin. At that moment when you look into the mirror and spot your skin turning dull and flaky that means this is the time to apply some exfoliation to get rid of dead skin cells and hidden impurities from your face. 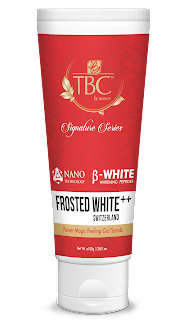 Keeping in mind all your concerns TBC by nature introduces their New Signature Series’s product Power Magic Peeling Gel Scrub for all skin type. It removes impurities from your skin instantly. Exfoliating your skin remains a vital part of the cleansing routine and natural and alcohol free products are the best to give to gentle and supple skin. Power Magic Peeling Scrub is a gel that visibly rolls, lifts and sweeps away dead skin cells when massaged onto skin. It replenishes your skin with the goodness of Pineapple, Pomegranate, Keratinase, effectively peel and help uncover a smooth, fresh, new complexion without drying, irritating, or causing undue stress to skin. It removes impurities and decongests clogged pores for a youthful, radiant look. It is Paraben free, removes dead skin cells and decongest clogged pores from the skin. TBC by nature’s product never lets you down in front of your friends and always take care of trust on brand. Once you start using a Power Magic Peeling Gel Scrub,you get that the results are undeniable. Availability- All leading departmental store across India.